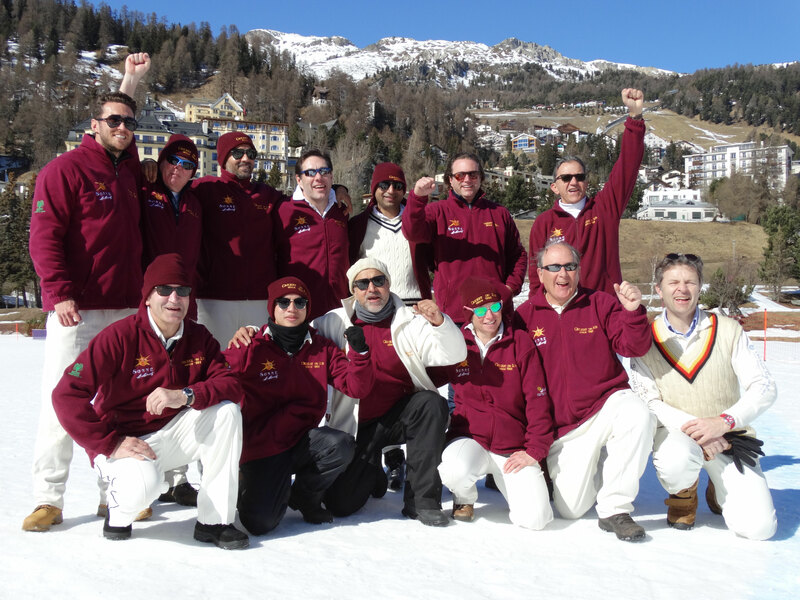 Old Cholmeleians XI won all three games against hosts St Moritz CC, Lyceum Alpinum XI & Gentlemen Gardeners XI in the 30th Cricket on Ice Trophy, the annual 20 over round-robin tournament played over three days (Thursday 23rd - Saturday 25th February) on the frozen lake in St Moritz. 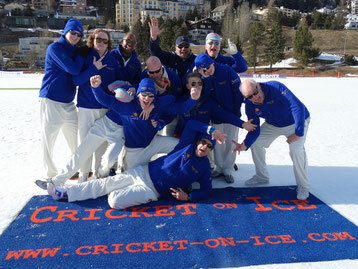 This year's tournament took place in blizzards and glorious sunshine alike. Old Cholmeleians XI began the tournament in a game played in glorious sunshine that went to the last ball to beat the hosts St Moritz CC, while Cricket on Ice debutants Gentlemen Gardeners XI had a slightly easier easier time against Lyceum Alpinum winning by 61 runs, although, in contrast with the first game, the second match was played in freezing temperatures & a blizzard. 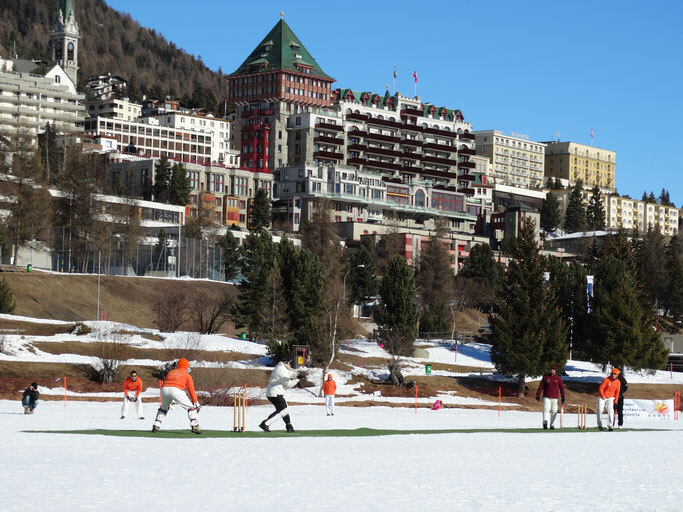 Despite the overcast skies and a blizzard in the morning, St Moritz witnessed another two games on the second day of the tournament. The morning game saw the hosts St Moritz beat Lyceum Alpinum by 9 wickets with just two balls to go, not least thanks to a hattrick by Gnana Thoppae and an unbeaten 50 by Khawer Memon, while in the afternoon Old Cholmeleians had a convincing 8 wicket victory against Gentlemen Gardeners XI, despite Anu Mohindru's 60 run contribution with the bat that was cancelled out by Mohsin Habib's unbeaten 54. Glorious sunshine and ideal temperatures greeted the teams on the third and final day of the tournament. 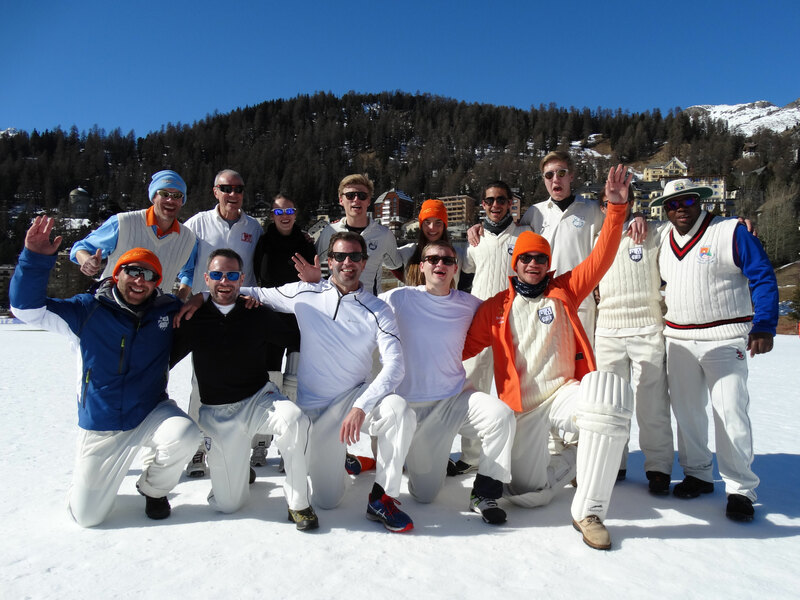 Victory for Old Cholmeleians XI against Lyceum Alpinum would secure the trophy outright and avoid and any net run-rate calculations to decide the tournament winner. And that they did winning by 66 runs to secure bragging rights until 2018 no least thanks to Mani Khalique's 65 for the Old Cholmeleians. 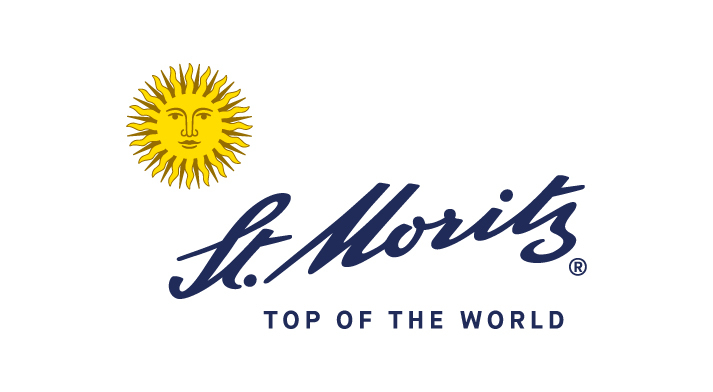 Later that day St Moritz CC secured runners-up spot with a win by 42 runs against Gentlemen Gardeners XI. This game witnessed the second hattrick of the tournament, again from St Moritz CC, but this time by Suhash Venkatesh. Brendan O'Leary the only player to reach double figures for Gentlemen Gardeners in this game. For the very first time, scores & results were documented using cricHQ, Cricket Switzerland's online results partner. Drinks & lunches were served on the ice between every match by Hotel Schweizerhof. 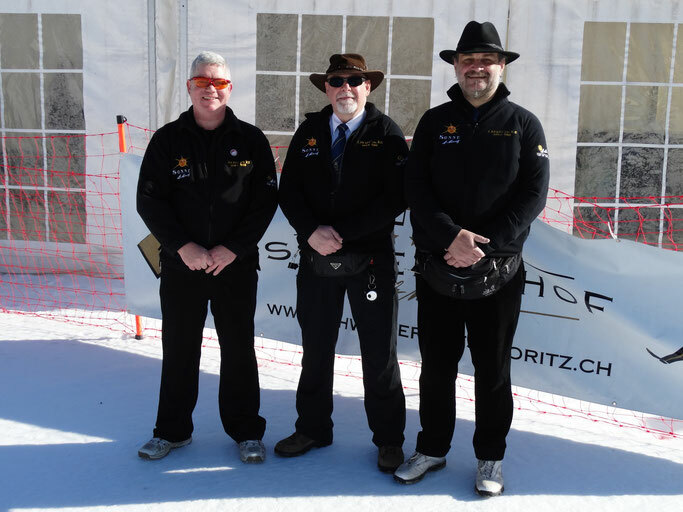 The officials for this event were Mr. Peter de Boeck (Umpire, Belgium), Mr. Andrew Scott (Umpire, Belgium), Mr. Alexander Mackay (Umpire, Switzerland) & Ms. Miriam Lodge (Scorer, Switzerland). If you would be interested in officiating at an event in the future, please contact Alex Mackay. 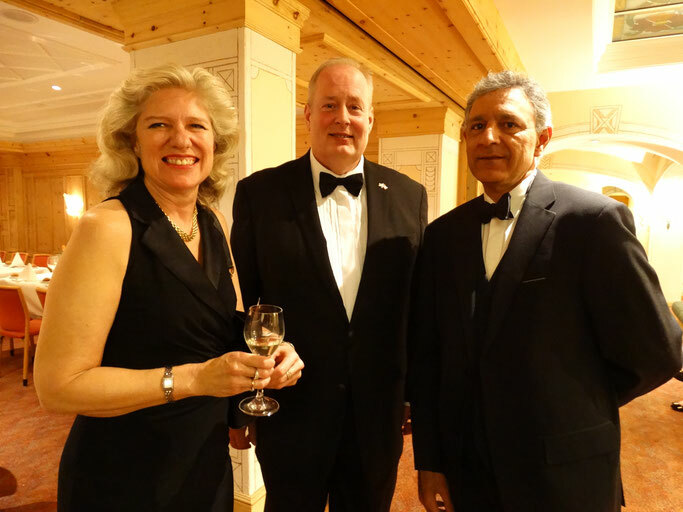 Off the ice, the black-tie awards banquet took place at the Hotel Steffani on Saturday evening from 7pm with special guests HM Ambassador David Moran & ex-England international Jack Richards. Also amongst the 80 plus guests was ex-England international Bob Barber. Suhash Venkatesh received the tournament MVP award for contributions with the bat & ball in all three St Moritz CC matches, not least for the second hattrick of the tournament. 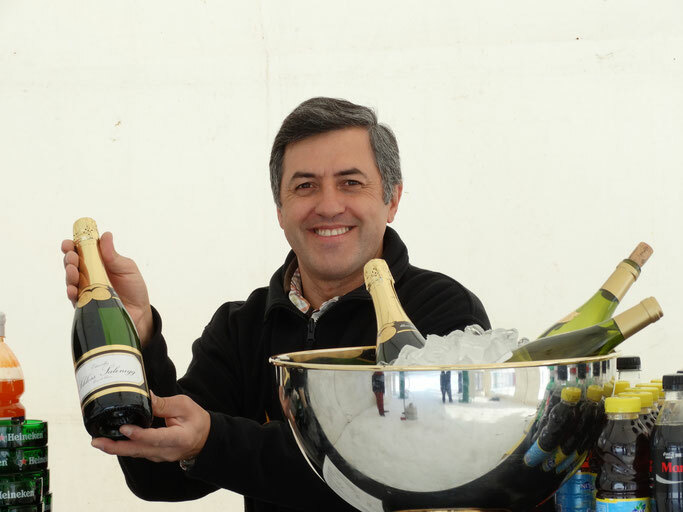 St Moritz CC President, John Hallam, received the Champagne moment award for a stunning catch at full stretch, while Alistair Webster QC of Gentlemen Gardeners had the honour of being recognised for the rubber duck award. Photographs from this year's Cricket on Ice Trophy are available in the 2017 gallery. Press & media enquiries should be directed to Mr. Alexander Mackay. 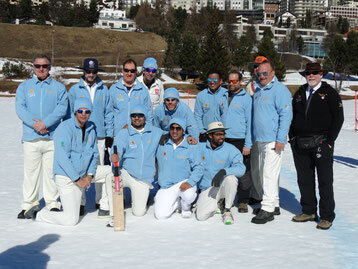 Further information on the Cricket on Ice Trophy is available from the St Moritz CC President, Mr John Hallam. Please check past events for previous St. Moritz Cricket Club activities.